After one of our regular Sunday dinners, E and I were thinking of what to try next. I blurted out that I wanted some seafood. After having such amazing seafood during my vacation to Oregon, I was hankering again for some. So E went on the hunt. The first thing she found was Fish. And they have a five course $28 tasting menu on Sundays. We were sold! Omigosh this place is so cute. Immediately, we both totally felt at ease. There’s a bar when you first walk in, and then a little dining room across the way. It’s light, airy, and very no-frills. 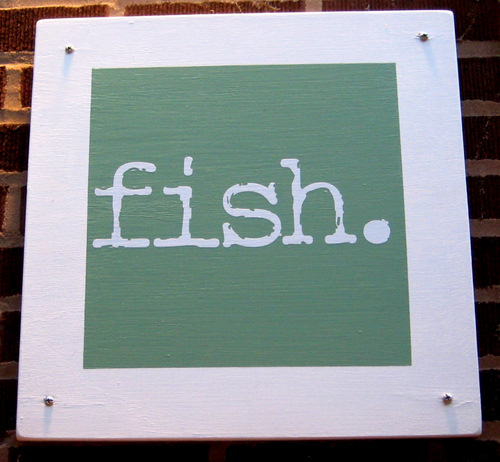 Aside from a few pieces of fish related artwork, the decor is quite sparse. And there’s nothing wrong with that. 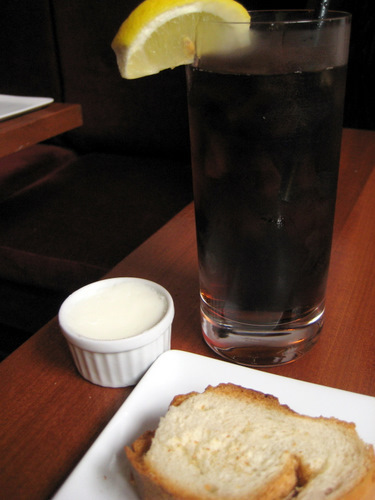 After you order, you get some bread and a little thing of freshly made goat milk butter. I’m not even into goat milk, and this butter was definitely not made of cow milk, but I still liked it. So let’s start with the courses! I’m going to tell you exactly what the menu said, and then I’m going to tell you what it really was. The menu only listed the ingredients, but did not really indicate how it would be prepared. Course 1 – Blue Bay Mussels, corn, marjoram, creme fraiche, fresno. When we saw mussels on the menu, we thought it would be some mussels in their shell, that would come out in a bowl. Oh no! 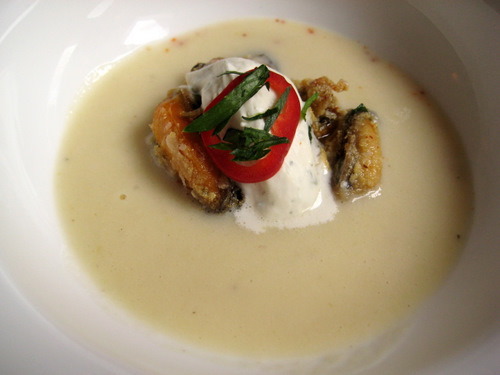 What came out was a bowl with some cornmeal dusted fried mussels, topped with creme fraiche, marjoram, and fresno pepper. Then they poured in a creamy corn soup into the bowl. It was a soup dish! And it was dreamy and creamy and the mussels were perfectly cooked. Seriously, this was such good food. It was only the first course, and we were already in love. 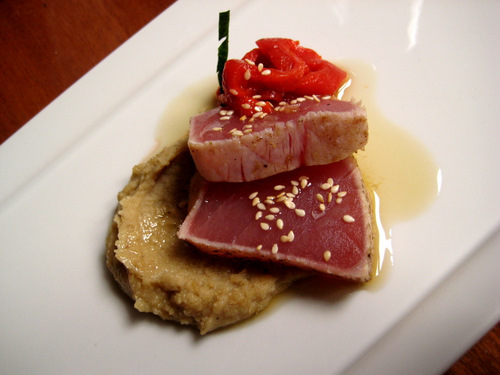 Course 2 – Big Eye Tuna, white beans, sesame, piquillo, brown butter. So here, the tuna slices were seared, and served on top of white bean hummus and brown butter, and topped with sesame seeds and sliced piquillo peppers. So let me say something about me. When it’s not sushi, I actually do not care for eating tuna. If I was at a seafood restaurant, I would never order a tuna steak. It just wouldn’t happen. It’s just not the fish for me. I’m much more into a white fish. But damn it, this thing was great. The fish was fresh, seared perfectly, the beans were smooth and nicely flavored, everything just really worked well together. Another winner! Course 3 – Monkfish, onions, bacon, mustard. Oh man, this was another great dish! The monkfish was topped with a onion and bacon relish and served with thick, handmade, mustard pasta. 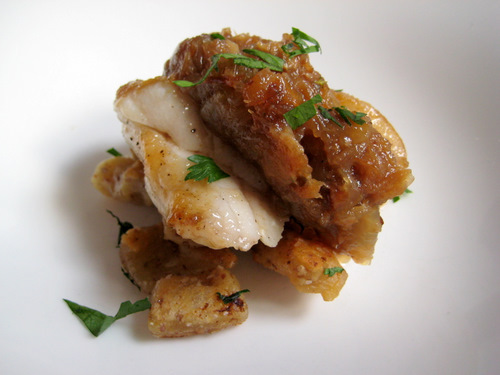 I love monkfish because it’s kind of a meaty type of fish. It definitely has bite. The onion and bacon relish went so well with the fish and added sweet and savory flavors. And I don’t even like mustard, but this pasta was dense and delicious. It didn’t taste very mustard-y at all, which I appreciated. Course 4 – Skate Wing, artichoke, orange, beet, ham. This dish was not only tasty, but just look at it! It’s so beautiful! 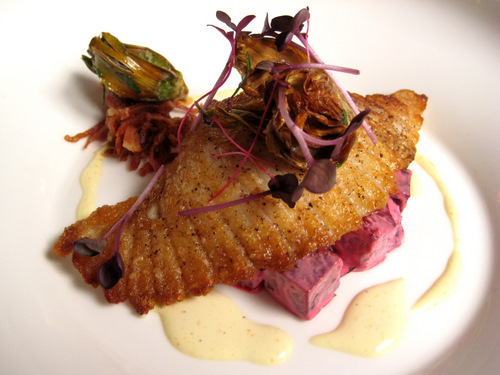 The skate is lightly pan fried and laid on top of some orange marinated beets. It’s served with some deep fried artichoke hearts and some little strips of fried ham. I loved it all! I don’t like artichoke, but when it’s deep fried, it’s like really thin and crispy french fries! The fish was light and flaky. I love beets so I really liked how these were prepared with the orange based sauce. Really, it was yet another great dish! 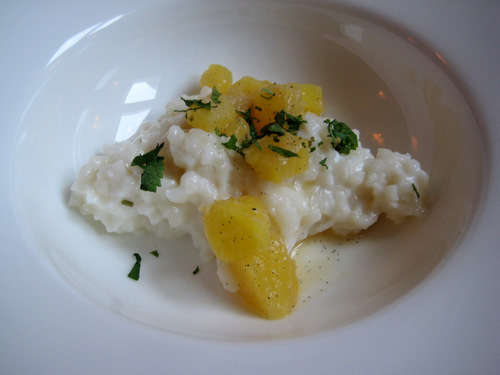 Course 5 – Coconut Rice Pudding, pineapple, rum vanilla. Finally, we finished off with some rice pudding. I’m a fan of rice pudding, but I know not everybody is. I’m not into coconut much, except when it’s in rice pudding. This pudding was so good! The rice wasn’t mushy, it definitely required chewing. The vanilla flavor was strong and sweet and the pineapple was also delicious and sweet. All in all, it was a delightful way to round out the meal. The service was impeccable. Our server was friendly, attentive, and knowledgeable. Yes, the portions are small, but it’s five courses! I didn’t get stuffed, but I was definitely full and quite satisfied. I didn’t feel like I missed out on anything. I didn’t feel like I needed to eat any more food. E and I were both thoroughly impressed with this meal. We loved every dish, we loved everything about the restaurant, we loved the service, and we want to go back regularly for another tasting menu. It changes each week, so we plan on going back when it’s more fall or winter instead of this hot summer we’ve been having. In case you were curious, they create the menu on Sunday mornings after taking a look at what’s on hand. So it’s not overly planned or designed. I love the fact that it’s somewhat off the cuff and yet these dishes taste and look impeccable. I highly implore all of you to go!